The first is according to the way our sages understood the last part of this passage. The last instruction in this section literally reads, “You shall not do so to the LORD your God” (Deuteronomy 12:4). Why would the Children of Israel want to do all of those things they did to the idols of Canaan to their own God? This doesn’t make sense. Therefore, the ESV and other modern translations work to smooth this out. They translate it to say something like, “You shall not worship the LORD your God in that way.” They understand it to mean that the Children of Israel must destroy the places of idol worship and not learn any pagan practices from them. But many of the sages understand this in a more literal sense and place it back into the immediate context. The end of the previous verse (v. 3) says, “[You shall] destroy their name out of that place.” Please keep in mind that the separation of verses is a fairly modern addition to the text. Thus, these two thoughts can be read together as, “[You shall] destroy their name out of that place; you shall not worship the LORD your God in that way.” Because of this there is a prohibition against erasing, marring, or destroying the name of God. It specifically applies to the Tetragrammaton, the Divine four-letter name of the Most High, typically represented in English as Y-H-V-H. This is why we do not write God’s sacred and holy Name on things that will eventually be destroyed or discarded, such as notebook paper or T-shirts. To do so would bring the most holy Name of God down to a mundane level. The Divine Name would essentially be “erased” once the item’s usefulness came to an end and was discarded. But there is even another way we can understand this passage. There are ways by which we can blot out the Name of Hashem through our actions. How can we do so? When we act in a manner that is not fitting for people who represent the God of Abraham, Isaac, and Jacob to the world, we are reducing His Name in their eyes. In effect, we are erasing it so that they see less and less of the God we claim to represent. We have previously discussed how our good works can help sanctify God’s name (see Matthew 5:16). But this is a way in which we can desecrate God’s name. 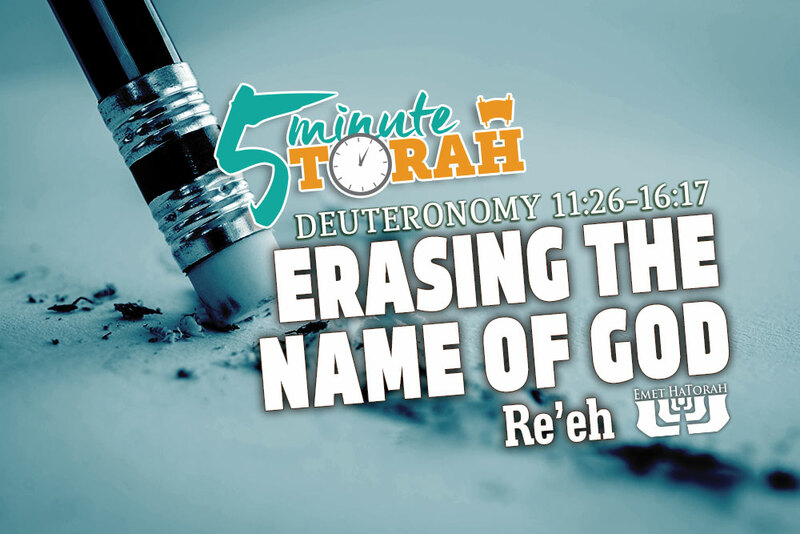 When we do such a thing it is called chillul Hashem, or “desecrating The Name.” When we literally and physically erase God’s Name we are desecrating it; but when we live in such a way as to misrepresent or dishonor Him we are also desecrating it. Let us not blot out the Name of our God in any manner, in order that His Name may be made great in and through us in this world.